“My doctor SAVED MY LIFE LITERALLY, gave up his Thanksgiving holidays so he would be in town if anything else happened. He just didn’t feel right to hand me over to one of his partners on call. Surgery went well but 18 hours later I took a turn for the worst and nearly died, the doctor held my hand until he got the OK to do surgery then he left my side only long enough to run ahead to scrub in. I could go on about what this doctor did, saving my life just doesn’t fit the bill, he did so much!” – Kimmie Dicaire. Medical science has been undergoing transformations since the onset of medicine; one thing remains the same, the dedicated commitment and aptitude of doctors to maintain and improve not only human life but, the science of medicine itself. Today, our Doctor’s work tirelessly to save lives, improve our quality and length of life by fighting disease and illness that plague the human race. National Doctor’s Day is the perfect opportunity to reflect on the history of medicine and appreciate the quality of health care available today. When was the last time you saw your doctor? Was it for something serious? Or just a routine checkup? How did you show your appreciation or thanks? National Doctors Day was first observed in 1933 by Eudora Brown Almond, wife to Dr. Charles B. Almond, to honor her husband and other physicians in their small southern town of Winder, Georgia. It was observed on the historic medical anniversary of the first successful administration of anesthesia by Dr. Crawford W. Long in Jefferson, Georgia, 1842. It wasn’t until 1990 that U.S. legislation finally approved a 1958 resolution to make Doctor’s Day a National holiday. The first observance included mailing cards to doctors and their families, putting red carnations on graves of deceased doctors, and a small luncheon. Now, celebrations include local award ceremonies and luncheons as well as community service outreach like blood drives and health fairs. How do you plan to celebrate this national holiday and thank that special doctor? Do you have a special doctor in your family that deserves recognition? During key happy and sad milestones in life, chances are that it included a doctor. So why not take inspiration and cue from this southern started tradition to show appreciation and thanks to that special doctor or to celebrate a loved one. Send a red carnation, send a thank you, send a personalized doctor gift. 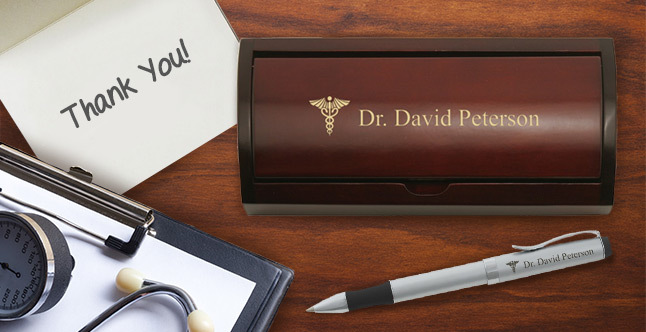 Award your doctor with a sophisticated and heartfelt thank you plaque to display on his/her desk, or encourage a recent graduate with this handsome personalized pen set! Either way, a heartfelt thank you or recognition will go a long way on this special day.